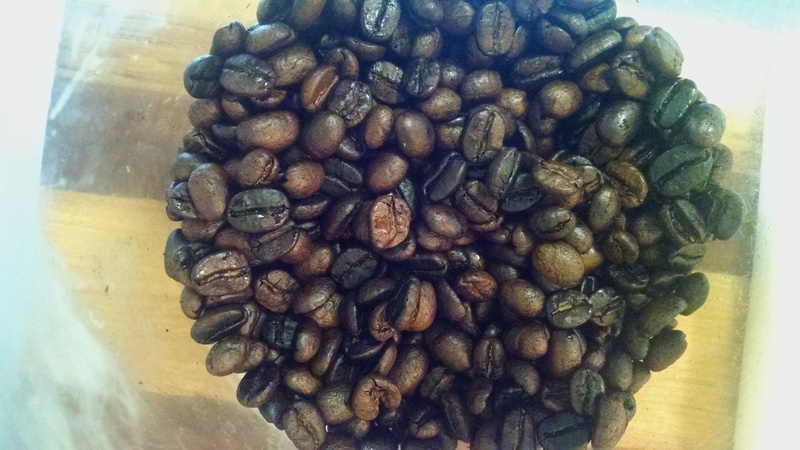 I have recently talked about roasting coffee at home and I even unintentionally got the pleasure of testing old coffee beans. This was not something I was planning on as I put some green coffee beans in a safe place and promptly forgot them. Based on the writing on the bag they are from 2013. These old coffee beans were put up, but nothing done to prevent them from humidity, oxygen, or odors. Once they were located recently the only way you could identify they were older was the date on the bag and the beans looked slightly less green with a hint of yellow to the bean. There was a little trepidation at roasting them, however as you can see from the picture above it turned out just fine. Despite the uneven roasting caused by me talking on the telephone during the entire process. It was my Sister’s Birthday this weekend and she called me one minute into the home roast. The roasting went fine and the first crack was successful. A very pleasant aroma wafted from the roasted beans after they cooled. At this point I knew it would taste fine. I was right as it is brews up a very good cup of coffee. Given the correct storage I am sure the slight oxidation of the green coffee beans would be minimal. I am a big fan of acquiring knowledge and skills. This accidental experiment worked out well and reassures me there is another valid reason to be home roasting. It also allows you to have a supply of coffee.